727 S. Lumina Avenue $3,275,000 • Wrightsville Beach Wrightsville Beach south end oceanfront! This rare family compound features a main house and detached guest house in a walled compound with 2 driveways for plenty of guest parking. 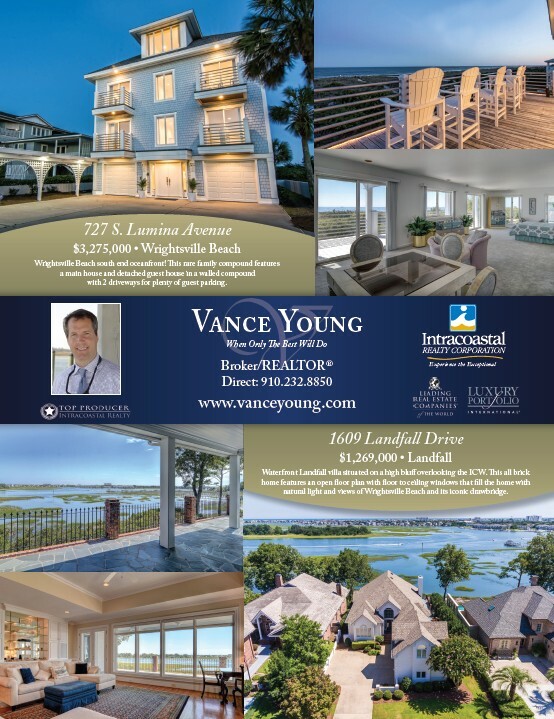 Vance Young When Only The Best Will Do Broker/REALTOR® Direct: 910.232.8850 www.vanceyoung.com Experience the Exceptional 1609 Landfall Drive $1,269,000 • Landfall Waterfront Landfall villa situated on a high bluff overlooking the ICW. This all brick home features an open floor plan with floor to ceiling windows that fill the home with natural light and views of Wrightsville Beach and its iconic drawbridge.